Deep Silver has announced a premium version of Saints Row IV. The Super Dangerous Wad Wad Edition, also known as The Million Dollar Pack, is limited to one copy and will only be available at GAME. It will sell for $1,000,000. The pack includes the Commander in Chief version of the game, a full day of spy training, a trip to space with Virgin Galactic, one year's membership to the E25 Supercar Club, a Lamborghini Gallardo, plastic surgery of the purchaser's choice, a shopping spree with a personal shopper, seven nights for two at The Jefferson Hotel in Washington, a "hostage rescue experience," a Toyota Prius, a life size Dubstep gun replica, and a seven-night stay at the Top Royal Suite at the Burj-al-arab with flights for two. 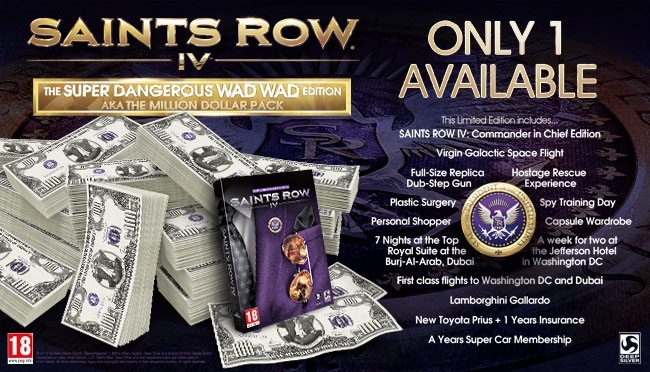 The highly exclusive Saints Row IV Million Dollar Pack is available for preorder at GAME and will be delivered in, "a truly presidential style," Deep Silver has stated. However, the pack's purchase is final in all circumstances and Deep Silver has the right to remove or amend any of the contents of the bundle at any time. Personally, I think this is completely insane, and so is anyone who would purchase such a thing. With that said, if someone had all of these things on their bucket list, this would be a good place to purchase because all the activities added up separately I guarantee costs more than $1,000,000. I will enjoy watching this play out in the near future with the game's release on August 20th.